It was business as usual for Robert Lewandowski in 2016/17 with Bayern Munich's fifth consecutive Bundesliga title, but the new season is promising to be once of the most exciting and unpredictable to date. The wait is almost over. After a 13-week hiatus, the Bundesliga swings back into action again on Friday when Bayern Munich open the season against Bayer Leverkusen. Five years is a long time in football but over that period there has been one constant in the footballing world: Bayern Munich have been champions of Germany. Five consecutive titles and the defending champions surely go into the new season as favourites once again with competitors lying in wait for a Bayern slip-up. “We want to cut the gap to Bayern,” asserted Borussia Dortmund goalkeeper Roman Bürki. Compared to last season, the Black-Yellows have been able to keep hold of almost all of their key performers as well as bring in Peter Bosz - a rising-star coach who knows how to get the best out of youth. Last term’s runners-up RB Leipzig will also be intent on keeping the title race alive for as long as possible this campaign. Ralph Hasenhüttl’s side made life tough for Bayern in 2016/17 and pushed them all the way up to Christmas. With both of their closest competitors strengthening, Bayern know they will not be alone in the title race. Bayern pulled off what many consider to be the transfer of the summer when they announced the two-year loan signing of James Rodriguez from Real Madrid. The Colombia international burst onto the world stage in 2014 when he took home the Golden Boot from the FIFA World Cup in Brazil, and now he’ll be looking to shine on the Bundesliga stage for the German record champions. He’ll also be joined at the Allianz Arena by the club’s record signing from Lyon: Corentin Tolisso. The 23-year-old Frenchman scored or assisted 13 goals in 31 Ligue 1 appearances last term and has already notched up his first assist with the Bavarians for Robert Lewandowski. Expect to see that combination plenty of times this season. It’s not just the champions who have been freshening up their squad with talent from abroad though. Dan-Axel Zagadou (Dortmund), Jean-Kevin Augustin (Leipzig), Denis Zakaria (Gladbach), Amine Harit (Schalke) and Ignacio Camacho (Wolfsburg) have all arrived in the Bundesliga with growing reputations. Watch this space. There are also some fresh faces on the touchline. Local rivals Dortmund and Schalke both brought in new coaches in the off-season, with the Black-Yellows recruiting Dutchman Peter Bosz to get the best out of their young squad and push for the title, while the Royal Blues have turned to 31-year-old Domenico Tedesco, who was at Bundesliga 2 side Aue last term. Quiz: How well do you know your Bundesliga coaches past and present? Mainz have kept true to form by promoting a young coach of their own from within: Sandro Schwarz. Bayer Leverkusen have drafted in Heiko Herrlich following back-to-back promotions with Jahn Regensburg, while Hannes Wolf will be cutting his teeth in the top flight for the first time after an impressive debut campaign with VfB Stuttgart in Bundesliga 2. Will it be Pierre-Emerick Aubameyang vs. Robert Lewandowski once again in 2017/18? Or will a new contender for the throne step up this season? The Dortmund and Bayern forwards fought tooth and nail until the final minute last term to decide who will be crowned Bundesliga top scorer. The Borussia man stole ahead at the death with two goals against Werder Bremen on the final day to finish with 31. Lewandowski fell just one short and became the first player in history to reach the 30-goal mark and not be top scorer. The pair are already in good form ahead of the new season with the Pole scoring twice against Chemnitz and Aubameyang even bagging a hat-trick against Rielasingen-Arlen in the DFB Cup. Read: Who is Germany's best centre forward? Anthony Modeste’s departure from Cologne leaves space for a new challenger to step into the breach and take on this prolific goalscoring duo. The German quartet of Timo Werner, Sandro Wagner, Max Kruse and Mario Gomez all had fine seasons in front of goal last time around. Can they push on in 2017/18? Youth continues to thrive in the Bundesliga and there’s no reason that will change any time soon. Timo Werner, Ousmane Dembele and Christian Pulisic all proved last season that age is but a number. Who else could make the Bundesliga stage their own this time round? bundesliga.com has scoured the youth academies of all 18 Bundesliga clubs to bring you the top 20 under-20 players to look out for this season. Will Kai Havertz still be the star pupil now his exams are over? Will Reece Oxford make the grade at Gladbach? Will Felix Passlack pass the test? Teenage Kicks Part I, players 20-16! Teenage Kicks Part II, players 15-11! Teenage Kicks Part III, players 10-6! Teenage Kicks Part IV, players 5-1! How often do you begin a new season thinking that all 18 clubs have the capabilities of qualifying for Europe come the end of the campaign? Well, expect things to be seriously tight in 2017/18. Serial European competitors Bayer Leverkusen, Borussia Mönchengladbach, Schalke and Wolfsburg all had disappointing campaigns last time out and will be itching to bounce back to where they belong. Leipzig, Hoffenheim, Hertha, Cologne and Freiburg all took advantage of these dips to finish in the top seven last term and are unlikely to be willing to give up on European football after having a taste of the action. Mainz, Augsburg, Hannover, Hamburg and Stuttgart have all featured in Europe within the last decade while Werder Bremen and Eintracht Frankfurt both came within a whisker last season. Think you know how the season will pan out? Then play our Official Bundesliga Predictor for the chance to win some great prizes! 7. Who could face the drop? Predicting who could make it into Europe is one thing, but who might go down? Impossible to say. Wolfsburg and Leverkusen were two sides unexpectedly thrust into the relegation battle last season. Could there be another surprise twist at the bottom this year? Will Hamburg and Bremen finally give their fans’ hearts a rest and keep clear of the drop this season? How will Augsburg do in a full campaign under Manuel Baum? It’s question after question and we’ll see the answers develop nicely over the course of 34 matches. Familiar faces return to the Bundesliga this season with Stuttgart and Hannover bouncing back at the first attempt. Both teams have made changes to their squads and backroom staff as they look to avoid a repeat of their horror shows in 2015/16 and re-establish themselves in the top flight. Five-time German champions Stuttgart in particular could be ones to watch under another one of the Bundesliga’s youthful coaching contingent: Hannes Wolf. Hannover return under Andre Breitenreiter, who was in charge of Schalke in 2015/16, and neither side will recommence their Bundesliga adventures with the intention of seeing it end quickly. 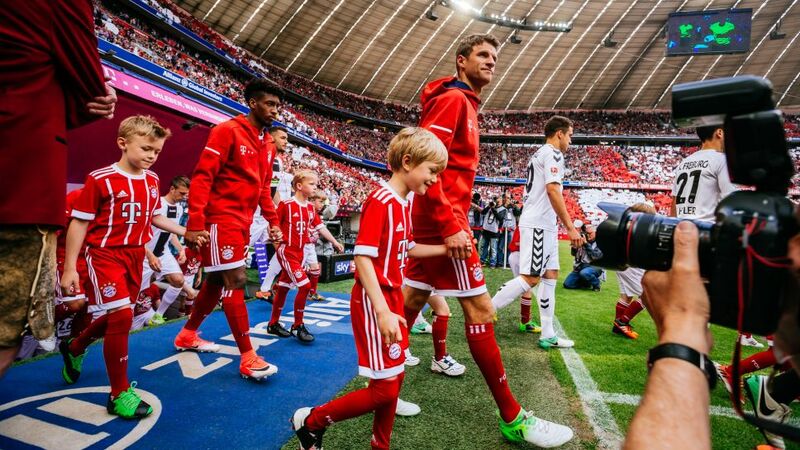 A new feature in Bundesliga matches this season is the addition of video assistants in every game. They are designed to help out the on-field referees by acting as an extra pair of eyes for key in-match situations and ensuring that decisions are correct as often as possible. All 23 Bundesliga officials from last season will be in action this term as video assistants, including Dr. Jochen Drees, Günter Perl and Wolfgang Stark, who all retired from on-field duties at the end of the last campaign. Not only is the system designed to make the Bundesliga more just but it will also add an extra element to play around the country. Professional German football continues to grow in popularity at home and abroad, and last season it enjoyed record numbers of fans passing through turnstiles. A whopping 19,049,362 spectators packed into stadiums to watch 612 Bundesliga and Bundesliga 2 matches in 2016/17, and that number could rise again this term with figures in the Bundesliga alone expected to rise following the return of Stuttgart and Hannover to the fold with their high-capacity stadiums. However, it is not just at home that the Bundesliga is attracting ever greater numbers of fans. The league’s popularity continues to grow around the world as its international stars delight audiences in around 200 countries with goals and drama aplenty. Click here for build-up to the Bundesliga's opening weekend.